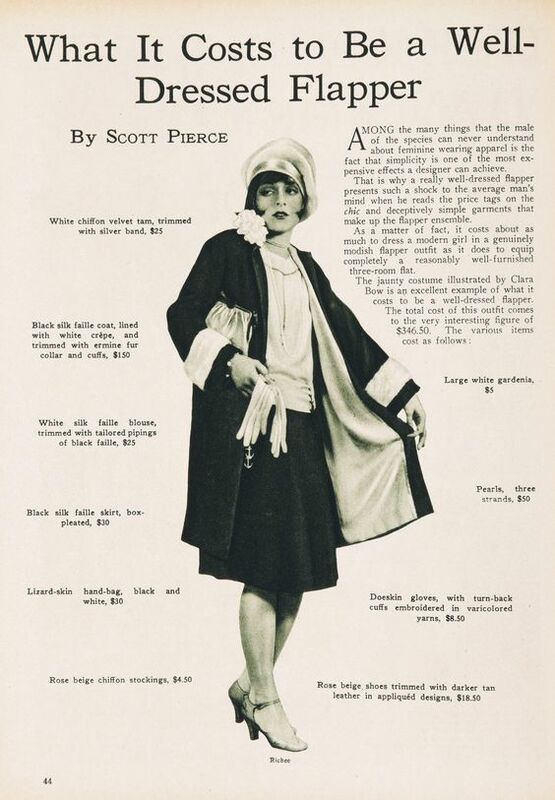 "What it costs to be a well dressed Flapper." The thing is, that the Flapper style was anything but complicated. The whole point for the woman's Flapper fashion was to look boyish, and wear modern yet elegant, relatively simple clothes. However, as the author of the article points out, "simplicit is one of the most expensive effects that a designer can achieve." Some of the prices don't seem unreasonable for certain items (eg pearls), and shoes can be very expensive today, so the prices are in line with today's prices. But for other items (e.g. stockings), the prices just seem outrageous.The price for the coat is not out of the world for a luxury coat but I'd expect a natural fur for that price, maybe not Mink, but some other critter. However, $348 for a silk blouse and hat each, just seems high... Then again, a stupid men's casual silk polo shirt today can run well over $120 (Tommy Bahamas). The stockings would have been knit from real silk. $62.80 is a bargain price for real silk stockings, assuming one could find them. The velvet cap would also have been real silk. I do not know of any textile manufacturer in the world today who makes 100% silk velvet (most modern “silk” velvet is rayon pile on a thin silk backing). The silver band, if real silver and I don’t see why not, would also jack up the price. Single gardenias today cost in the range of $10-$25, barely two or three times the 1925 price. Perhaps horticulture has gotten more efficient. $5 for a gardenia in 1925 was crazy expensive. Women’s clothing is considerably more expensive than men’s, even when the quality is lower. $348 for a silk blouse is not even something to blink at. $348 for a silk faille blouse actually seems a bit low. Faille is a very heavyweight ribbed luxury silk, almost an upholstery fabric, and very difficult to find these days. Basically what the author of the original article has done is a piece of clever sleight-of-hand, decking out Ms. Bow in some of the thickest, heaviest luxury fabrics available at the time and then throwing up his hands in shock at how much such a “simple” outfit costs. I also get the feeling that the article was one of many critiquing the Flapper lifestyle. There was quite a bit of controversy of the look and sexual freedom that Flappers enjoyed at the time. Some of the more outlandish psudo-medical claims in the early 1920's was that the short shingle bobs of the period would lead to headaches in women due to the nape of the neck being exposed to cold air! Might the gardenia have been a silk flower too? And choosing a movie star as a "typical" example of clothing prices is part of the problem. I remember once reading an article titled "Get the Look for Less" the designer version came to several thousand including a $900 blazer. The "Less" was only $300. I realized I needed the article on how to "Get Look for Less, for Less (or even less)"